Ask fellow campers about "Washington Park Campground" and nearby attractions. Small city run park, on an amazing piece of property, with views every direction. Good stuff, 3 day weekend, made a reservation (need to be two weeks in advance, 50/50 ratio of first come) it was to be a cold one, and was. Hook ups worked well, water was turned on, sites need some major cleaned of branches. Cell service is spotty in places, campground loop bathrooms are being replaced, but others available at beach area. Lots of old growth trees, plenty of trails, and paved loop open to traffic limited. Don't think your satellite is working here. It won't, and if you want sun, hike to find your spot. You won't be disappointed. Low rated because of bathrooms still not completed, and water/power are located in the front part of sites. We will return for sure. We camped at Washington Park Campground in a Motorhome. You are less then a mile to catch ferry to the San Juan Island. If you don't know about them, adventure awaits you. This is a very rustic campground, with very tall and large shade trees so dense as to render the whole campground dark for much of the day. The roads through the campground are dirt with numerous potholes, and sites consist of pine needles. We have seen two Class As in the park, but would recommend it only for the adventurous. Most sites are back in, and some are not level at all. The rate shown is for electric and water service; a dump station is at the park exit. Sites with any reservations during the current month have a calendar page showing which dates in the month are reserved. 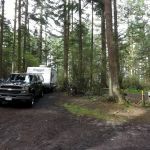 The campground is only a couple of miles from the Anacortes-Sidney, BC, ferry, so is an excellent place for an overnight when leaving or arriving. A two mile long loop road running around the point is very popular with walkers, and is definitely worth a tour, either on foot or by car. We stayed here both coming and going to Sidney, B.C., and would stay here again when traveling through. We camped at Washington Park Campground in a Motorhome. Anacortes is about 4 miles away and offers many pubs, grilles, and restaurants for all tastes. This is such a beautiful park to visit with so many view points, and short bike ride to Anacortes. The restrooms this visit are in need of major work, but will return. We camped at Washington Park Campground in a Motorhome. This park gets a 9 out of 10 from me because for us it was really nice, very woodsy and quiet. The sites were a little muddy at our late March arrival date, and the roads are narrow. I would not want to bring anything longer than a 28 foot trailer in here. If you have a trailer that size or smaller, you can do it. Some sites are tight to get into, but if you persevere it is well worth it. There is a trail network leading out of the campground to amazing views over the ocean. There is also a swimming beach. This is a camping in the woods experienced which we loved! For those accustomed to manicured level sites, they might not like it so much. We camped at Washington Park Campground in a Travel Trailer. Safeway 3 miles away in Anacortes. First weekend of the season. Perfect weather. Site A-10 was very private. Great hiking and view points to die for of San Juan Islands. A short bike trip to Anacortes and close to ferry terminal. Would stay again. We camped at Washington Park Campground in a Motorhome. For our setup this park works fine. We are a 17' trailer and we like a woodsy setting. Reminds me of a USFS campground. Being February, I expected the water to be turned off at the sites, but it was on! Bathrooms were closed for the season in the camp loops - a bit inconvenient but we had our own in the trailer. Very shaded. Great trails. I'd stay again. We camped at Washington Park Campground in a Travel Trailer. I read the reviews on the site before camping here. I have to say that the reviews are right: the roads are narrow; the entrance to the campground is narrow; the sites are not level. BUT it is extremely family friendly and for the money, you really can't beat it! We really enjoyed our time here and enjoyed having the deer come visit us while we ate dinner. The tide pools were great, but were in an area that was too steep to take our two year old. It is in a fantastic location and my little girl loved throwing rocks into the water. Some sites would accommodate a big rig and we actually saw some larger motorhomes in a couple of sites. Be prepared to bring a lot of leveling blocks! We would camp here again. We camped at Washington Park Campground in a Travel Trailer. I have camped here for the last 20 years and have never had a bad time. This is a camp ground with electric and water; not a full service RV park on pavement with cables. This is a clean family oriented great treed camp. I can't really remember the rate but it was fair. Thank you Anacortes for this camp. I don't recommend bringing anything over 30 feet. We camped at Washington Park Campground in a Fifth Wheel. The prior reviews, even though old, are still correct. The location is great, out on a point over-looking the San Juan Islands, and very close to the Washington Ferry departure terminal, but: Very tight entrance and narrow campground roads, sites are small and not level. Campground has water and electric, but no sewer or dump station. So many trees you can barely see the sun. This place needs some major fixing up. Better off staying at Pioneer Trails or the Indian Casino RV park. We chose not to stay here and moved on. "We did not stay in this park". We camped at Washington Park Campground in a Fifth Wheel. I can not understand the other low ratings. This is a city owned park designed much like state parks. No, it is not a 5 star park but it has the ocean, trees, boat launch and the San Juan Island ferry terminal within a mile. If you like to camp with trees and a camp fire instead of wi-fi and cable this is a park for you. It has a dump station on the way out. I have not had a bad stay here in the last 19 years of use. We camped at Washington Park Campground in a Motorhome. We actually did not spend the night at Washington Park. After a long detour over extremely rough road, we arrived at the park. The narrow one-way road was overgrown and muddy. Had trouble negotiating the steep grades in the mud. 5th wheel scraped on sides from trees and brush. The sites were small, for this novice...too difficult to back in to, and I doubt I would have had room to extend the slide. For those wanting a "deep woods" experience, this park might be just the ticket. It simply wasn't for my wife and myself! We camped at Washington Park Campground in a Fifth Wheel. The only reason we stayed here is because A. We didn't know any better and B. Our friends house was a block away. The park is owned and operated by the City of Anacortes and it appears that there is no one here that knows how to run an RV park. This is definitely not a big rig friendly park. Our motorhome is only 30' and we had a heck of a time in this park. The roads were dirt and very muddy as well as narrow. My biggest problem with the park is that it is layed out so that you have to pull nose-in to all the sites as the hookups are at the front of each site and on the wrong side. However, the traffic flow through the park is backwards making it extreemly difficult to pull into a site. Because of the backward flow the pull through site we found had the hookups on the wrong side. I had to do a big turn around number to get into the site. The pay station was a vending machine type of system that wouldn't accept crisp new $20 bills, so we had to wait for one of the park employees to find us (the office wasn't readily identifiable) The park is situated in the woods with really tall cedars, which means that your satellite receiver won't work. Because of the density of the forest, little or no sun gets through either. Trees are so close that awnings are practically useless. On top of all this, the park doesn't accept reservations except from residents of the city of Anacortes! What ? I can't even begin to try and comprehend this policy. My advice would be to bypass this one and go 10 minutes down the road to Deception Pass State park. Besides the main campground, there is a little known and smaller campground on Bowman Bay that is great. We camped at Washington Park Campground in a Motorhome. Are you affiliated with Washington Park Campground ?